As retrogaming as a pastime grows, more and more people are tempted by the superior high end analogue RGB CRT displays that are finding their way onto the second-hand market at ever decreasing prices. Sony PVM and BVM monitors seem to be a popular choice amongst retrogamers with their wide range of input options and all the fine adjustment bells and whistles you could possibly want. High-end input is nearly always via BNC connectors though and up until recently, connecting your retro console to these has mainly been a case of a trip to Maplins and a session with your soldering iron. The cable we are reviewing here allows you to forego all that shennanegins and connect to your PVM/BVM via a standard RGB SCART lead instead. We received our standard breakout cable from Retro Gaming Cables (retrogamingcables.co.uk) who also supply a version with a sync separator built in (an extra £10). Both cables are visually the same though, with a female SCART connector on one end plus 4 BNC connectors and 2 RCA jacks at the other. The red, green and blue video signals plus sync are output via the BNC connectors and the left and right audio is output via the 2 RCA jacks. The cable is fully screened using copper shielding to minimise any electrical interference and it is also fully grounded inside the SCART to minimise any compatibility issues. The connectors themselves are all gold plated. Their construction appears to be of a very high quality and I would imagine built to last for years to come. Once the breakout cable is all rigged up to your PVM/BVM, connecting different games consoles is as simple as unplugging and plugging a single SCART via your female SCART connector. For someone normally used to composite output on a consumer CRT, the image quality is astounding and cannot be faulted. Sound quality is also crisp and clear although I did have to use a stereo to mono adapter on my PVM (a PVM1444QM) as it only has one audio input. Retro Gaming Cables have even thought of that though, and do offer the adapter as an option when purchasing your cable (£2). Customer service is second to none also, with Rob replying to any queries in a timely and friendly fashion. In short, dealing with Retro Gaming Cables is a pleasure. 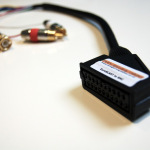 If you need an affordable solution in order to connect your SCART consoles to broadcast quality monitors look no further than the RGB SCART to BNC breakout cables from Retro Gaming Cables. High quality cables and good customer service make for a perfect combination.